Home > 2016 > 09/24 > Does Jacob Trouba’s trade request create an opportunity for the Oilers? Jacob Trouba has requested a trade from the Winnipeg Jets. The Edmonton Oilers, like many other teams, have a need for defensive help on the right side. Is there an opportunity here for the club to further bolster the position? There has been no negotiation regarding the terms of a contract between our client and the Jets over the course of the last several months. The situation is not about money; it is solely about our client having the opportunity to realize his potential as a right shot NHL defenseman. Winnipeg is of course the home to both Dustin Byfuglien and Tyler Myers, both strong right-shooting defencemen. Byfuglien was recently extended through 2021, while Myers is in his mid-twenties and has three seasons left on his contract. It has been evident for a while now that the Jets have an overabundance of quality right shot defencemen. The contract impasse with Trouba, along with his request for a trade, is likely to force movement. I can’t help wondering if dealing away Myers isn’t the best choice for Winnipeg, though the trouble with that idea is that Myers will be paid an average of just $3.5 million for the next three season and the Jets need to be cost-conscious. More likely, Trouba’s request will result in the trade of Trouba. There isn’t much question that the Oilers should be following this situation closely. We’ve talked about Trouba on this website previously. He’s just 22 years old, from the same draft class as Griffin Reinhart; he’s only one year older than Darnell Nurse. Despite this, he’s already a proven major-league defenceman capable of playing in all situations. He’s big, he’s physical, he’s a great skater, he’s good with the puck and we aren’t even close to seeing him in his prime yet. 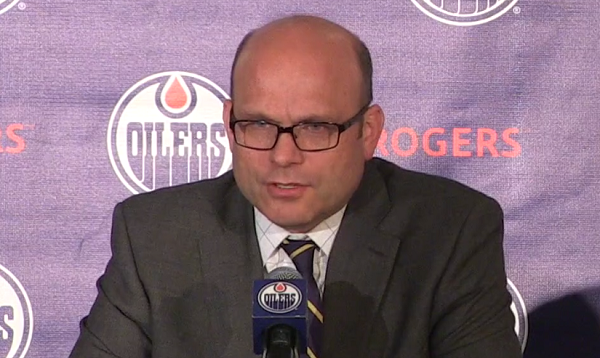 If Peter Chiarelli really wants to accelerate the Oilers’ rise from the bottom of the league, that’s the way to do it. The cost of any deal is likely to be dear, but that shouldn’t necessarily stop Chiarelli from pursuing a trade. The addition of Larsson, after all, came at a heavy cost, but Edmonton’s management decided it was worthwhile because in their view it made the team more balanced and competitive. 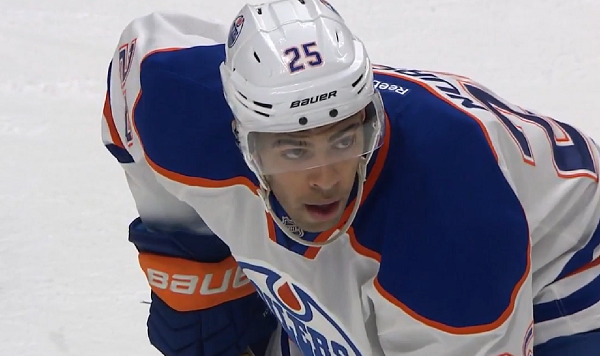 Something built around Darnell Nurse is the obvious package. Winnipeg has decent depth down the middle, between emerging pivot Mark Scheifele and veteran Bryan Little, and that’s before we even get into Mathieu Perreault or their ridiculous collection of young forwards. Left-shooting defencemen, on the other hand, are in short supply in Manitoba. With all due respect toward 30-somethings Toby Enstrom and Mark Stuart, the Jets could really use an upgrade there, particularly an upgrade who is the same age as their emerging players. The Oilers have plenty of futures they could toss in to sweeten such a deal, starting with Griffin Reinhart. Whether Winnipeg would consider a package built around Nurse is another question entirely, but for the Oilers its close to a no-brainer. Between Klefbom, Sekera, Davidson, Nurse, Reinhart, and virtually every single prospect of note in the system, Edmonton’s pretty much covered on the left side for the foreseeable future. The same isn’t true on the right side, where it’s basically Larsson and Fayne. Of course, the Oilers aren’t the only team with a need for help on the right side. The Jets aren’t in a great position, what with the season being right around the corner and Trouba unsigned, but they do have one advantage: Just about everybody could use a good right-shooting defenceman. Does Ryan Nugent-Hopkins have a long-term place on Edmonton’s roster? I would deal Nurse, if it was for Trouba, even throw in Yakupov to sweeten the deal. You people are delirious. Trouba is not a top pairing d…he has that potential…potential. Nurse also has potential. Those are two guys whose biggest strength is their future. Nurse has the added benefit of being on his cheap entry level deal and expansion draft proof. In addition Trouba’s public trade demand reduces his value. Nurse plus a 1st round AND somebody else some of you are saying? Trouba is not worth anywhere near that and Winnipeg is not going to get anything like that. Begin with Nurse straight up and perhaps sweeten the pot with a 2nd or 3rd rounder. Luckily Chiarelli is not as irrational as fans posting here. Pete, you’d better not f*** around with this. Go in strong. Nurse + 2017 1st for Trouba. Boom!!! Deal done. Back end fixed. Only hole left is backup goalie. I would guess Puljujarvi would be the starting point from Winnipeg’s perspective. Nurse and Benson for Trouba and Winnipeg’s second next year , to compensate/offset for Chia . The expansion draft makes this deal tough. Adding trouba is excellent, but what does that open us up to losing in the off season. Conversely, what does that open the Jets up to losing? Arguably, Trouba is being left unprotected, or one of their LDs would be picked, but I see this as unlikely to be left open as they are already thin at LD compared to their right side. Which means Troubadour is likely going one way or the other. The Jets are in tough and are likely hoping for a roster player that is expansion exempt or secondarily a bunch of high draft picks. And when you look at the acquisition of Trouba for picks, the costs you have to also factor in is losing a more solid D in expansion than you might otherwise have lost, which has to diminish the picks you’re willing to give up. If it were me, I’d swing for Reinheart and Yak and a 3rd, which they likely decline. With the hopes we land on reinheart, yak and a second. I can’t see the Jets getting fair value, or the trade would already have gotten done. The GM just announced he’s been trying to trade him since May. And I don’t see them not trading him, because he’s going in the expansion pool either way. Nurse is a non starter for me, not because the value isn’t equivalent (nurse is a little low) but because he’s draft exempt. Those players are gold in my eyes. Nurse? Pool Party? Davidson? Reinhart (barfs a little)? C’mon man. Why would Winnipeg trade a fully operational quality NHL D man for “maybes” or up and comers? Would you? It actually happens quite often in this salary cap era , that a top player is trade for prospects. If I have to pick Nurse or Puljujarvi ?? , Nurse is gone. Does Chris Pronger ring any bells? Who in their right mind would not like to have Trouba on the team? We all would! Suggesting that the price would be JP is way out there. JP was a gift and one that will help this team for years to come. If JP is the exchange request by the Jets, then there is no deal. JP will be in the Oil silks for years to come. Who the hell is PJ? Sorry about that! My Bad. Fixed. There are a lot of things I like about Trouba, but hold the phone! Yes a lot of teams will be interested, but I’m sure GM’s have been asking for months. PC has no doubt inquired and probably will negotiate. I don’t see him moving Nurse since Vegas can’t take him. Nor do I see the Jets wanting him without a lot of other pieces added. They need a top 4 LHD as their biggest need. I don’t think Klefbom would ever, ever be on the table. Davidson might be, I would hate to see him go. But PC can only protect 4 Dmen and 4 forwards. Pouliot will be claimed no matter how you draw it up right now. So the question is: If Trouba joins the team will he be in salary fight again and grossly overpaid or does PC find common ground. I’m guessing that’s another thing he loved about the Larsson trade. I think the Oilers would be a legit playoff contender with Trouba depending on what is given up. The only logical pieces are ones we don’t want to part with but might have to. And I would all but guarantee RNH and Leon will NOT get moved. Neither will JP. Reinhart, Yakupov & draft pick ! I like Nurse. I’m not dissuaded by his less than stellar fancy stats last year. Good coaches shelter rookie defencemen, so of course TM didn’t. Now some want Nurse to spend part or all of next season in the AHL learning the game better. They should have done that last season, IMO. After saying all of that, I don’t see a scenario where the Jets trade Trouba to Edmonton for Nurse. You’re probably looking at Klefbom for Trouba. I’d do that. Not because I dislike Klef, but because he’s played 43% of games played during his ELC. Add a RHD like Trouba and now they have solid depth on the RH side for the first time in forever, and it clears up the logjam at LHD a little. It will leave some room to bring in Paigin or Jones next season on the LH side and leave Bear in the AHL next season. Davidson, Reinhart, Yakupov, 2017 1st rounder for Trouba and 2017 2nd rounder. This gives Winnipeg some young depth on LD plus some quality futures (let’s not forget Yak is still 22, most players that age are still viewed as prospects. Yeah yeah Trouba is 22, I said MOST!). It gives us some protection from the expansion draft, though I imagine we’d lose Pouliot in this scenario. It also replaces the 2nd rounder we lose to Boston for Chia so we don’t have to wait until the 3rd round to make a pick next year. Oh yeah, the best part is we will have an actual NHL defence and Darnell Nurse is still in the organization. Feel free to trash if you see fit. I’d do it as well. What’s not to like? Really looks like a legitimate NHL D core. I really hope Chiarelli can somehow pull this off. 1. What kind of money that Trouba actually want? 2. Can the Oilers be able to sign him for long turn? 3. Expansion draft is coming up, who should the Oilers protect if Trouba is with the Oilers? Love to see Trouba in an Oilers jersey, but in my books Nurse is off the table. I wouldn’t trade that guy unless I couldn’t turn it down. In fact, Nurse and Trouba could form an unbelievably fierce and mobile tandem, capable of playing every aspect of the game. That tandem would get my vote, and be worth waiting for, since Nurse may need another year of development. Trouba’s salary demand plays a part. Would Sekera waive his clause? Or maybe Eberle, as a relative price point. This way, the Jets get someone capable of immediate contribution, too. Work a package around one of those guys, but don’t overpay. Trouba not only wants out, but it’s because he’s third behind two other guys at his position on his current team. His value is based on potential, which fits in well here. Darnell is still learning, but Nurse-Trouba would be worth the wait. Imagine the intimidation of those two and Lucic on the ice at the same time. Every one of them can skate and transport the puck, but who would want to wander into a scrum with all three? A mobile defense is paramount in today’s game. Any tandem that can skate as well as Nurse-Trouba while being tough AND mean, that’s even better. Young, fast, and built to last. A second pairing capable of becoming a first pairing. Those are the boxes I’d like to see checked off, even if it costs some veteran leadership and scoring. The Oilers are deeper now, and can afford some of it for the right return. Boldness. Sekera’s stock is up. Eberle has elite-scorer value. Hopefully the Jets would see one of them as the right return value, perhaps with an incentive, but having Nurse AND Trouba is intriguing. I’d hate to see Nurse go but you have to give to get. Oilers would still be physical enough without Nurse. I don’t think it’s wise to consider Sekera in a trade . That would be a step back. Most people are slotting Darnell as a 6 or 7 dman this year and Trouba would be your 2nd pairing right d and a trip to the playoffs. We gotta keep this McDavid kid happy. As long as we are getting ridiculous with our trade proposals how about we acquire Trouba, Laine, Byfuglien and two first rounders for CMD, Eberle, Reinhart and a second? These are options that are being thrown out for a current 2nd pairing d-man with potential to be a first pairing d-man? I would love to have Trouba on this team but the trade proposals are treating him as a developed first pairing d-man, which he is not. He is a very good developing d-man but that is what he is – frankly, his offence has stagnated/regressed since his rookie season and I don’t see a ceiling any higher than Darnell Nurse’s. Considering Nurse is on his ELC and does not need to be protected in the expansion draft and Trouba is looking for somewhat big money and term and would need to be protected, I would be remiss to even offer up Nurse for him. Sure Trouba for Nurse makes the team better next year but not necessarily in the future, especially when you consider that we would have to expose Davidson in the expansion draft. Not good if we are scared to make a move based on losing Davidson . I think Trouba gets us into the playoffs.